The British Consulate in Kingston Jamaica also handles all diplomatic matters for The Bahamas. If you need to apply for a British visa in The Bahamas then the Consulate in Kingston is where this process starts. Speak to the embassy staff in Kingston Jamaica for more information about obtaining a British visa or renewing your British passport while in Jamaica. We have listed all the contact details for the embassy in Kingston below. 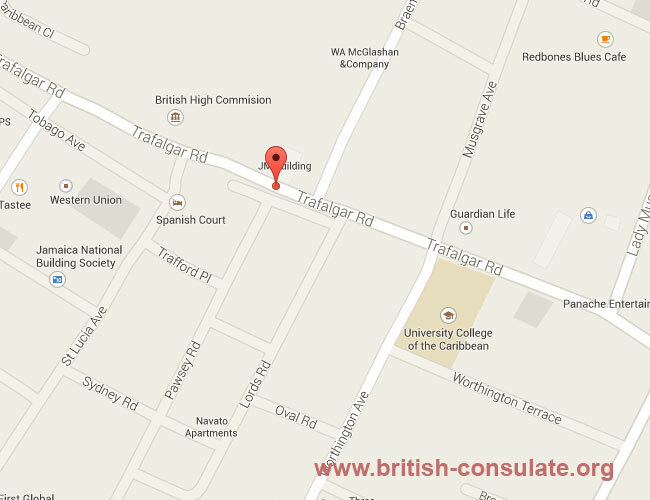 We have also included a map for the British consulate in Jamaica for this purpose. Like other countries and embassies it is usually best to email them your questions. Details: The British High Commissioner in Kingston, Jamaica is cross-accredited to The Bahamas. These are the public holidays in Jamaica and for the British embassy in Kingston. Note that the embassy is closed on Jamaica holidays and some British holidays. You will note that the National Day of Jamaica is listed or as it calls it Independence day. Call or email the embassy before you visit the Embassy in Kingston. These are what the average processing times for those who have applied for a British visa in Jamaica are at present. Like everything else ensure that you have all the needed documents for your application so that the visa process is smooth. Any documents that are short will create a delay in the visa process. You will note that the process times are on average 2-3 weeks which is rather fast considering the location.